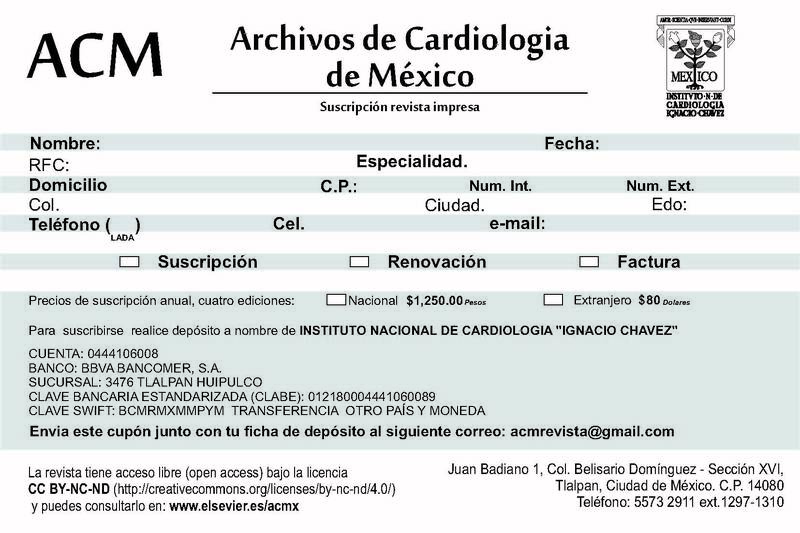 Inicio Archivos de Cardiología de México Adults with congenital heart disease: A growing public health problem? Adults with congenital heart disease: A growing public health problem? Adultos con cardiopatía congénita: ¿un problema de salud pública creciente? Correspondence to: Department of Clinic and Research Cardiology, SOMA Clinic, Calle 51 # 45-93, Medellin 0954, Colombia. Tel. : +57 45768651. Congenital heart disease (CHD) is the most common defect; one out of every 100 live-born infants has CHD. Due to advances in pediatric cardiovascular surgery, today, over 85% of children with CHD survive to adulthood.1 In Europe, there is an estimated population of 2.3 million adults with CHD (ACHD), which surpasses the pediatric population of 1.9 million.2 In the United States (US), in 2010, 1.4 million ACHD were recorded vs. one million children with CHD.3 In Latin America, in 2009, Brazil calculated approximately 552,000 ACHD.4 Extrapolation of this data gives an estimated 1.2 million ACHD in South America. The ACHD population will continue to increase, with a 5–6% annual growth rate. The new ACHD population, known as GUCH (Grown-Up Congenital Heart Disease) will be a public health problem in the next 10–20 years, due to the rapid increase in complex CHD survivors (single ventricle heart, hypoplastic left heart), with new hybrid treatment techniques resulting in children operated on today becoming postoperative adults with CHD remnants, after-effects and complications. Adult congenital heart disease. Past, present, and future. Geriatric congenital heart disease: a new challenge in the care of adults with congenital heart disease?. S. Gilboa, O. Devine, J. Kucik, et al. Congenital heart defects in the United States estimating the magnitude of the affected population in 2010. J. Pinto, K. Branco, R. Cavalcante, et al. Epidemiology of congenital heart disease in Brazil. H. Kaemmerer, U. Bauer, U. Pensl, et al. Management of emergencies in adults with congenital cardiac disease. A. Mackie, D. Tran, A. Marelli, et al. Cost of congenital heart disease hospitalizations in Canada: a population-based study. D. Briston, E. Bradley, A. Sabanayagam, et al. Health care costs for adults with congenital heart disease in the United States 2002 to 2012. L. Nguyen, T. Maul, M. Hindes, et al. Current and future status of adult congenital training in North America. H. Baumgartner, W. Budts, M. Chessa, et al. Recommendations for organization of care for adults with congenital heart disease and for training in the subspecialty of ‘Grown-up Congenital Heart Disease’ in Europe: a position paper of the Working Group on Grown-up Congenital Heart Disease of the European Society of Cardiology. K. Stout, A. Valente, P. Bartz, et al. Task Force 6: Pediatric Cardiology Fellowship Training in Adult Congenital Heart Disease. A. Kempny, R. Fernández-Jiménez, O. Tutarel, et al. Meeting the challenge: the evolving global landscape of adult congenital heart disease. R. Cordina, S. Nasir, I. Kotchetkova, et al. Management errors in adults with congenital heart disease: prevalence, sources, and consequences. M. Connelly, G. Webb, J. Somerville, et al. Canadian consensus conference on adult congenital heart disease 1996. C. Warnes, R. Williams, T. Bashore, et al. ACC/AHA 2008 Guidelines for the management of adults with congenital heart disease. H. Baumgartner, P. Bonhoeffer, N. De Groot, et al. ESC Guidelines for the management of grown-up congenital heart disease (new version 2010). A. Bhatt, E. Foster, K. Kuehl, et al. Congenital heart disease in the older adult a scientific statement from the American Heart Association. The adult with congenital heart disease. Born to be bad?.